Dynamic Visualization™ is Fujifilm’s latest image processing technology, providing outstanding first-up detail and virtually eliminating the need for post processing. Customizable menus help simplify dose-saving techniques. Exposure Index (EI) and Deviation Index (DI) guides and tracks deviation from preferred exposure conditions for each exam. 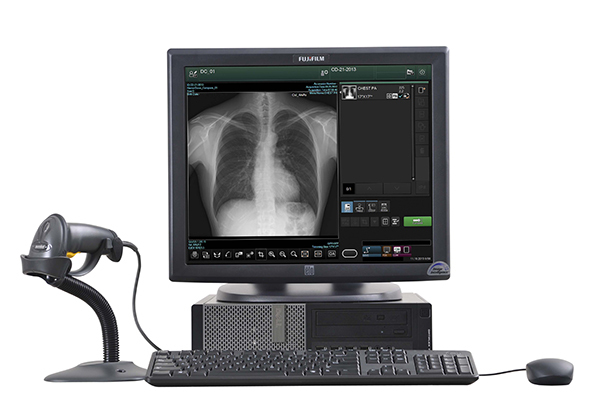 EI and DI values can be sent in DICOM headers, allowing low dose initiative monitoring. Multi-Accession opens multiple studies with separate accessions for the same patient in one acquisition screen. Auto trimming simplifies offset imaging by automatically detecting the exposure area. The true sized cropped image is sent to PACS, for optimal image display size at both workstations. Region of Interest (ROI) image adjustment — unique 2-point ROI function that reprocesses images instantly based on user-selected points of interest. Image Stitching (optional) for DR and CR automatically combines multiple adjoining images into a single long length image for scoliosis and long leg studies.